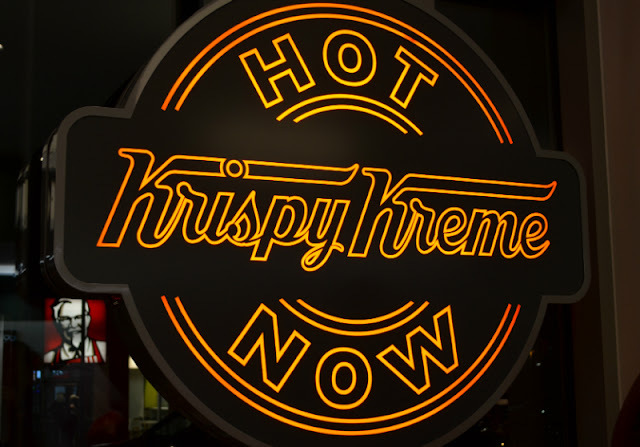 Ever So Juliet | Edinburgh lifestyle blog: Krispy Kreme opens in Edinburgh! Krispy Kreme opens in Edinburgh! For the last few months Krispy Kreme have been popping up all over Edinburgh, handing out free boxes of doughnuts (it's been pretty good!). This has all been to promote the opening of their first Scottish store which opens today! Earlier this week I was invited along to the V.I.P. opening (best Monday ever!) to check out what they have on offer. I'm easily won over by doughnuts so be prepared for the sugary giddiness that is about to follow! SO MANY DOUGHNUTS. The store is in Hermiston Gait, which is a big (and pretty lifeless) retail park on the edge of the city. It's a bit out of the centre of town, but perfect if you are out shopping or driving back into Edinburgh (it has a drive thru! SO indulgent!). 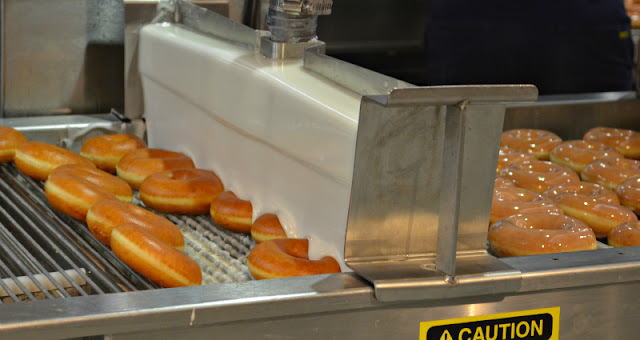 When you walk into the store you can see a huge window that shows you what's going on in the kitchen - I think it's really interesting to see exactly how they doughnuts are made! First the doughnut batter is heated up in a special booth that lets the dough rise up until it's all soft & fluffy. Then they drop into hot vegetable oil, fry until golden brown, flip, and fry on the other side. Then the conveyor belt moves them under a icing fountain (look! It's ace!) and then cools them down. We were given fresh doughnuts that has just been iced and they were DELICIOUS. So hot and melt-in-the-mouth & ace! We also got a chance to tour the kitchen, and decorate our own doughnuts in a massive chocolate fountain! It was so much fun (look at the delighted faces above). Eventually after eating a mountain of sugar (and being handed 24 doughnuts to take away with us... good grief), we staggered back home. I have since been living off Krispy Kreme and contemplating my first trip to the drive thru... although I might need a wee break from sugar after this week! The new store opened at 7am this morning and will be open until 10pm every night. Oh wow, this looks fantastic! 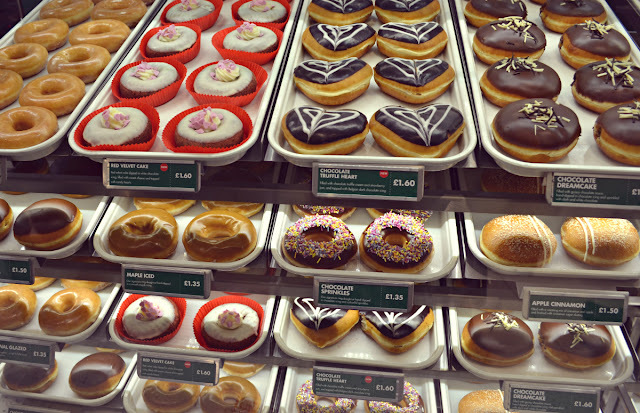 I don't care what anyone says, Krispy Kreme doughnuts are delicious! You lucky duck! I love the Krispy Kreme factory stores! I don't have any around here, just Dunkin' Donuts, and they don't make 'em in front of your eyes like that! Must've been awesome to be invited to an event like that! I'm so happy about this... I miss being able to get them whenever I wanted (far too often of course...!) in London. Wish it was more central though. I'm going to have to do a bus trip I think! those donuts looks so yummy. i could need one right now. 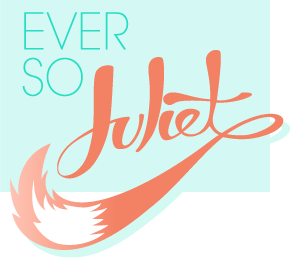 and your blog is so lovely, just came across it. Jealous! 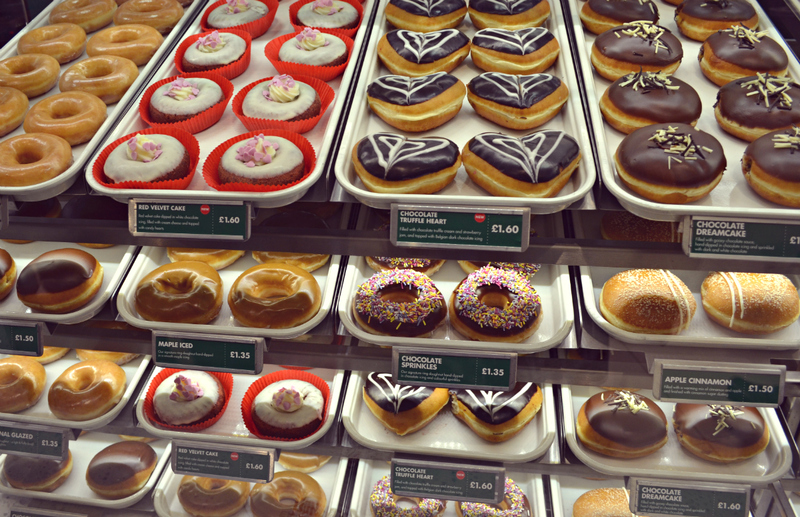 I live Krispy Kreme, I want one in Glasgow! crowd when your card is sitting on the desk of a potential client or lead. These kind of Playing Plastic card printing are classified as the latest buzz in the promoting industry and a lot of everyone is getting likely in direction of the employment of credit card publishing.